Kate Kristopher has grown up with magic in her life. 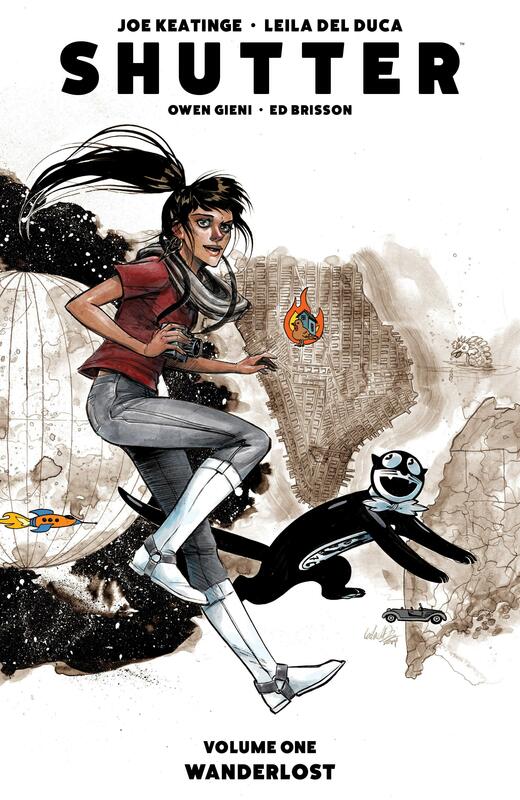 From the age of seven she explored other worlds with her father, following a family tradition. 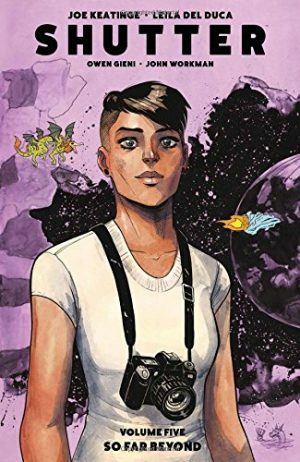 That ended ten years later when her father died, since when Kate has scrubbed a living as a photographer, but lives in a void, shutting out the real world, never mind exploring beyond it. On her 27th birthday she’s attacked by ghostly purple ninjas at her father’s grave, and given some stunning information that shifts her life back into phase. By our standards Kate’s existence is extraordinary anyway, with Leila del Duca’s sample art only a glimpse into her world, where humans co-exist with all kinds of species straight from children’s fantasy. 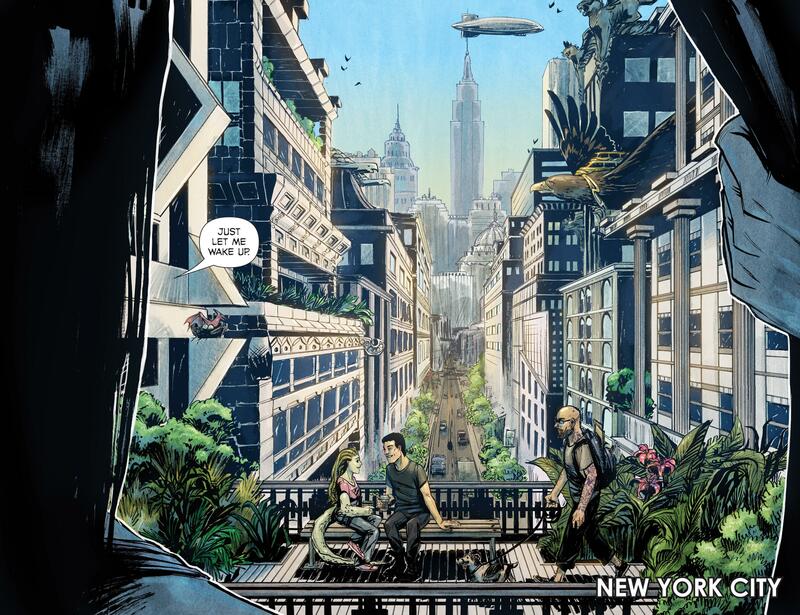 One of the wonders of Shutter is how Joe Keatinge and del Duca add to this world, every chapter introducing someone or something beautifully out of place, which makes for some breathtaking images. A downside is del Duca packing her pages with so much detail and so much action that with her loose style it’s not always easy to follow what’s going on. It’s almost the case that her strengths as a designer overshadow her skills at telling a story. 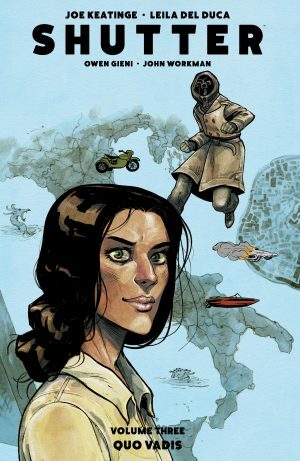 Shutter is very reliant on recollections and reminiscing for its mood, and Keatinge populates these with more storybook characters, but deliberately perverting most, twisting them into something very nasty. The heart of the story becomes how well Kate actually knew her father and what he got up to when she wasn’t with him. This is introduced in stages, piling up until becomes one giant glop of frustration and anger for Kate. Some relief is provided by interesting, quiet moments, such as the explanation of how a film projector works, but there’s not enough of it. 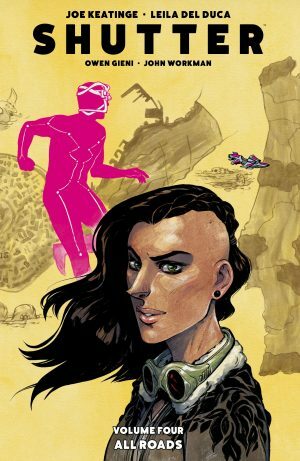 Defining Kate so narrowly is deliberate, perhaps only to surprise later (in volume four, All Roads), but the surprise isn’t worth potentially putting people off at the beginning. Misguided elements of that nature are why for all the imagination at work, Wanderlost isn’t entirely successful. The prevailing angry mood requires greater balance, and the pacing is off, with too many incidents and staged moments in effect reiterating the same thing without greatly moving matters forward. Fantasy stories, and this is a fantasy story irrespective of some real world trappings and industrial language, unfurl at a leisurely pace, so perhaps that’s to be expected, and by the final chapter there has been some movement setting up Way of the World, but it’s a long time in coming. 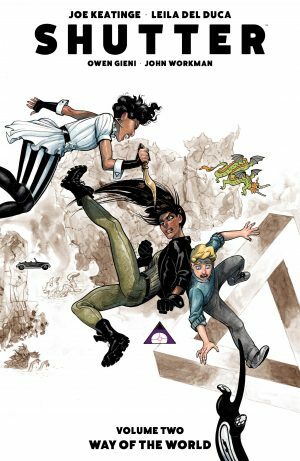 Don’t be put off, and consider Wanderlost perhaps a prologue, as Shutter is a complete story over five volumes that builds and expands, and while neither creator is firing on all cylinders here, there’s a rapid improvement.